Modern door locks are surprisingly complex, making it difficult for many people to identify the manufacturer and lock type just by looking at the device. This can pose a challenge for those looking to replace their existing locks, or find locks that will best suit their needs. By knowing what kind of features to look for and how to find them, you can learn how to more easily identify and distinguish different types of locks. Understand the basic lock forms. Most locks are either cylindrical or mortised. A cylindrical lock is installed through a round hole in the door. When it is viewed from the edge of the door, the latch plate will appear fairly short, generally ranging from 2 to 3 inches. A mortise lock is installed into a pocket within the door. When viewed from the edge of the door, mortise locks will have a much longer latch plate, generally 4 inches or more. Check to see if you have an entrance handleset. These locks often combine a cylindrical lock and a deadbolt into one unit. They will typically have a long handle that connects at two points along an entrance door. From the side of the door, you'll see two separate bolts protruding through the latch plate. The deadbolt will be higher than the latch, and they may be close together or separated by several inches. Decide if your lock uses a non-keyed function. Non-keyed locks include passage sets and privacy locks. Passage sets are used to latch a door, but do not use keys or cylinders. They are often used on closets, offices and bedroom doors. Privacy sets do not have a key or cylinder, but can be locked using a thumb turn or push button. They are typically found in bathrooms and some bedrooms. Determine if your lock has a keyed function. Any lock that requires a key or has a keyhole will have a keyed function. If the door can be locked using a key from the outside or a push button inside, it has an entrance/office function lock. If the door is always locked from the outside unless opened with a key, it has a storeroom function lock. Other specialty functions are also available, but they are not typically found in residential applications. Consider auxiliary locks. Many doors have separate deadbolts or surface bolts that are used to add security to an exterior door. A deadbolt requires a key from the outside, and has a thumb turn on the inside in most cases. It is distinguished from a lockset in that it has no handle or lever. Surface bolts feature a lock and strike installed on the interior surface of the door and frame. They may or may not have an exterior cylinder, though all will have either a thumb turn or push button lock inside. Look at the trim options. When replacing a lock, you'll often be asked what kind of trim you'd prefer. This may include doorknobs or levers, as well as many different kinds of handles. 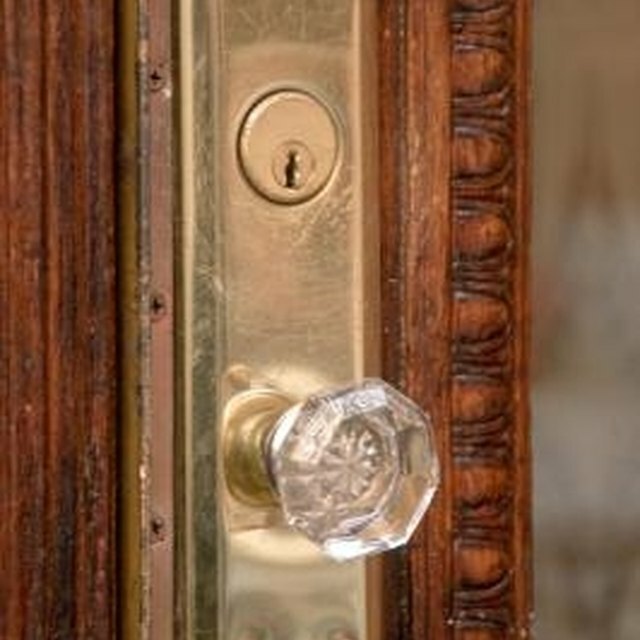 The trim also includes any plates that wrap around the lock or the base of the knob. Round plates are known as roses, and are very common. Longer plates are called escutcheons or backplates, and are available in many different styles. Examine the lock to find the brand name or manufacturer. This is often printed on the front of the cylinder, just above the keyhole. It may also be found on the latch plate along the edge of the door. If you need to locate the brand name, but are unable to do so, take it to a local locksmith. They will usually be able to identify the manufacturer based on the lock design, the keyway, or even the profile of the key itself. What Is a Door Casing? Why Is Grading Important On a Lockset?